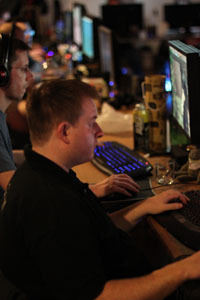 A LAN party is a gathering of gaming enthusiasts all in one physical location. The idea is to enjoy gaming on a fast lag-free network while enjoying a social atmosphere with gamers who you may have only previously spoken to online. epic.LAN is a series of LAN parties organised by a team of people from epic gaming Ltd. who play games for fun themselves. At the moment the main events are held in Kettering (UK) throughout the year. epic.LAN is brought to you by a team with over ten years of experience organising LAN parties and other related gaming events as well as a wide range of related industry experience. Members of the team have attended LAN events worldwide so have a good idea about what is desired by participants. At the moment we have plenty of people available to help out with the event, but if we need more people in the future, we'll ask via our website. If people want to help out packing down after the events though, that is always appreciated! You can sign up for an event seat by visiting the events page, you'll be able to sign up for a provisional place, but your seat is not confirmed until you pay for your seat. Unfortunately we cannot hold seats for people until they pay. Once you have paid you'll be able to pick where you want to sit on our seating plan. We currently accept payment via Paypal, Credit/Debit Card or Bank Transfer. We don't have an age limit on our events, however those under 16 are required to send signed parental consent to us before they can participate in the event. The forms will be available on our site shortly. If it's a PC game and it has network capabilities, you can play it. Just find someone else on the LAN who wants to join in. You can also bring consoles or use our public console area. epic.LANs are Bring Your Own Computer (BYOC) events, so you'll need to bring everything related to your PC including all of your own software and games. You'll also need to bring a 4-way power strip as we provide one socket per participant. Can I plug in my...? Probably not! The only items you can plug into the epic.LAN network are those relating to your PC and low powered peripheral items such as phone chargers. Items such as microwaves, kettles, mini-fridges and desk fans are not permitted. We'll have a number of consoles in the social area that are free for anyone to play on. We don't mind if you want to bring a console to your seat too, but you'll have to use the same monitor as your PC and we ask that you only have one system plugged in at once. Can I bring two screens? No, there is only really sufficient room and power for one monitor per person. You share a 6ft desk with another participant, so please be considerate with monitor sizes and other equipment on your desk. Am I allowed to use speakers? No, all sounds must be played through headphones. Can I bring my own network kit for additional connections? No. We provide one Cat5 cable per PC, any additional connections should be ordered when you book your place. The additional connections are only intended for items such as laptops or consoles, if you intend to bring a server to play on, then you should look at our colocation service. You are not permitted to share any copyright or illegal materials on our network. An FTP server will be available on the network for legitimate file needs such as patches, maps and mods. Yes, there will be internet access at the events for key services such as web browsing, msn, irc etc. If you have any additional requirements for the internet access, ask us at the event. Can I play online games at the event? It is a LAN party, so really we'd like everyone to play on the LAN, but we appreciate that you may wish to play on an online server, so that will be ok. MMOs are permitted. Will there be any servers running on the LAN? We'll have a good range of dedicated servers available at the LAN, just ask us if you want us to host a server for any particular games? Will you be running any tournaments? Yes, we run a range of fun and prize-winning competitive tournaments at our main events. Can I bring my own alcohol into the venue? No, the venue premises are licensed therefore all drinks must be purchased from the bar. Anyone found to bring their own alcohol into the venue will be asked to leave. We'll have a kettle and microwave available for you to prepare snacks. There is a catering service on site and there are loads of food outlets in the nearby town that will deliver to the venue. We'll also have some basic snack and soft/caffeine drink items on sale at the staff area. If you need to sleep, then you can sleep in the main hall, in tents (free of charge) or in the indoor sleeping areas, we strongly recommend using earplugs in the communal sleeping areas. Alternatively, local hotels are listed under the relevant event pages. Yes, the Kettering venue has showers available (our Bagnall venue does not). Details of the location and opening times will be on the event intranet. Bear in mind they will be busy during peak times like first thing in the morning. Who is responsible for my equipment at the LAN? You are - epic.LAN does not take any responsibility for your equipment at any time during the event. You are strongly advised to take security measures such as locking your equipment to the table and not leaving small valuable items around. How do you know who should be in the event? Everybody at the event will be given a wristband to wear which also tells the bar staff if you're old enough to purchase alcohol. Anyone without a wristband will not be allowed in to the venue. Staff will be on duty throughout the night to check wristbands. Insurance is not provided for your equipment, you are advised to make your own insurance arrangements. Some home contents providers will extend policies to cover you at such events. Public Liability insurance is provided, but this is for people not equipment. Are there any first aiders at the event? Qualified first aid cover is available at all times through the event.